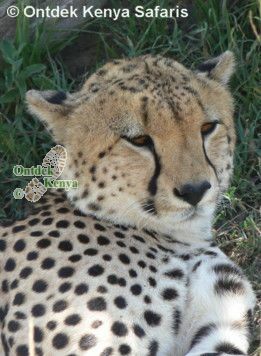 Ontdek Kenya crafts unique African wildlife safaris for clients seeking one of a kind nature journeys rather than the hectic package safaris covering all parks in Kenya. We are not an office-bound tour re-seller, we are a dedicated team of nature people right on the ground and as we accompany clients on safaris it matters to us that we create African wildlife safaris that have quality time dedicated to game viewing, the best services possible and that we stay away from mass tourism. Go directly to the itineraries of our African wildlife safaris. What makes Ontdek's African Wildlife Safaris unique? Unlike package safaris to Kenya which feature long and exhausting one-day transfers e.g. Nairobi to Samburu or Samburu to Nakuru, we give you our candid approach on national parks selections enabling you to have a quality wildlife viewing experience with minimal transfers. Remember: however good an alternative wildlife safari itinerary that covers many parks looks, on the ground it will be exhausting and with less time for quality wildlife viewing. - We encourage you to stay in one location for a minimum 2 or 3 nights so as to have enough time to explore the parks. This way your tour is more relaxed and your African wildlife safari is not rushed. - Our clients appreciate the fact that we take them to places that are not visited by mass tourism. These are mainly private game conservancies and the small national parks that are full of easy to see game on vehicle drives or while on walking safaris. - Our African wildlife safaris don’t go by the 2 game drives/day safari rule. We go for maximum time in the field as defined by you - the client. Yes, you will find us enjoying a lion chasing a prey at 12 noon – the very time that other tourists are idling away in hotel lounges waiting for the 4pm game drive! Read more on how we organize our guided tours in Kenya. - We are proud of our Kenya safari guides who will accompany you throughout your wildlife safari. They are accomplished naturalists who take your wildlife viewing tour way beyond the “Big Five” as they give you insights into the Africa eco-system in an educational yet fun way. - Our African wildlife safaris are operated as private safaris or selected small group departures of min 4 and maximum 10. This gives our clients a one-on-one contact with our guides. Who will be your co-travelers in your African wildlife safari? Our clients have a very strong interest in nature be it game viewing, bird watching, walking or nature photography. So you will not find yourself trapped in a group that just wants to "chase game". On accommodation we tend to go to small safari camps and lodges but quality properties with unique character rather than the high-traffic tourist hotels. We don't do camping, making this a perfect African safari holiday for travelers of all ages. Our booking decisions are based on the property’s close proximity to client’s preferred activities, quality accommodation and overall service which we review regularly. In choosing an outfitter for your African wildlife safari it matters that you pick one who shares your interests, approach to nature and is of course reliable. At Ontdek Kenya, truly nature themed safaris are our personal signatures and we look forward to consulting with you to plan your safari. 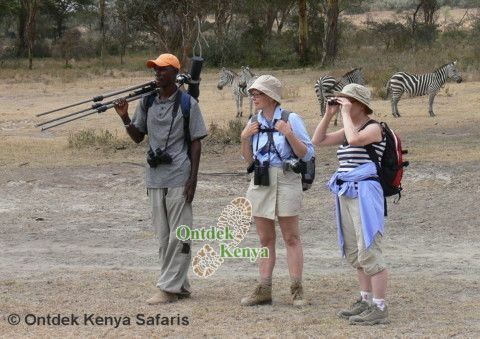 Contact Ontdek Kenya Safaris to start making your dream trip a reality. 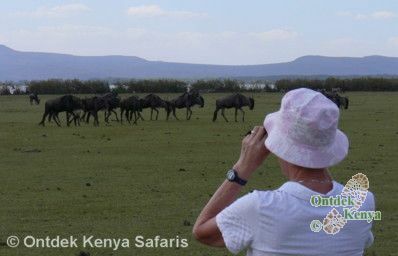 Your Kenya safari starts in the Aberdare sanctuary where you will see giraffes, elands, zebras with the backdrop of Mt. Kenya and the Aberdare Ranges. Move on to the Solio Conservancy and see the largest concentration of Rhinos in your Africa safari. Spend a night of wildlife viewing from the balcony of Treetops - a tree hotel in the Aberdares. The safari then progresses to scenic places in the Great Rift Valley for more wildlife viewing in Crescent Island and Crater Lake. These are private conservancies with huge numbers of giraffes, waterbucks, elands, zebras and various gazelles - easily seen on foot. An African safari holiday is nearly incomplete without a visit to Masai Mara which takes the last 3 days of the tour with elephants, lions, leopards, cheetahs, topis, wildebeest, and hippos all calling for our attention. A walk guided by Masai Morans is among the many highlights in this African adventure. See detailed itinerary. This African wildlife safari visits Masai Mara, Lake Nakuru, the private conservancy of Swara Plains and finishes off with Amboseli National Park, situated at the foot of Africa's highest mountain: Kilimanjaro. You can expect to see elephants, buffaloes, rhinos in Lake Nakuru, lions, leopards, cheetahs, hippos and a lot of plains game. All areas visited are equally good for bird watching; our naturalist guides are accomplished birders and will definitely pass on their passion for birds to you. See detailed itinerary. This is a relaxed 9 days African wildlife safari that visits our popular private game conservancies in the Rift Valley and the Swara Plains - highlight here is the huge numbers of oryx, elands and other plains game. A safari in Amboseli with the snow-capped Kilimanjaro takes 3 days giving us enough time to see huge herds of elephants, rhinos, buffaloes, cats and plains game. This wildlife safari is very ideal for keen birders and wildlife photographers as there is enough time per location to allow for thorough exploration. See detailed itinerary. This 8 days southern Kenya wildlife safari starts with Amboseli National Park at the foot of the snow-capped Kilimanjaro, then Tsavo, the land of the man-eaters lions with one-off viewings of huge herds of elephants, buffaloes, giraffes as well as lions, leopards and cheetahs. As you come back to Nairobi finish the tour with a safari in the Swara Plains conservancy and see huge numbers of plains game such as elands, oryx, gazelles and resident wildebeests - all in absence of mass tourism. The scenery ranges from the snow-capped Kilimanjaro while in Amboseli to very dramatic hills in Tsavo, making this African wildlife safari ideal for birders and photographers alike. See detailed itinerary. 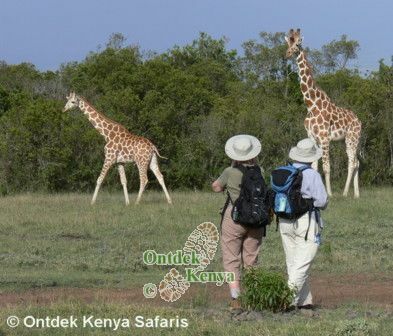 For a consultation on Africa wildlife safaris, contact Ontdek Kenya safaris, we have over 20 years of experience in the organizing of wildlife tours in Kenya.